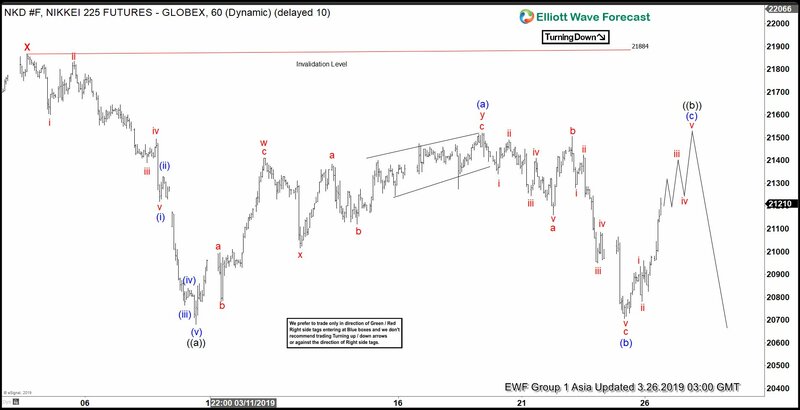 Elliott Wave view is calling an end to Nikkei’s rally from December 26, 2018 low with wave X at 21884. The Index should resume the move lower and should eventually break below wave December 26, 2018 low. Or at minimum, the Index should do a larger 3 waves pullback to correct the cycle from 19055 low. Down from wave X at 21884, the decline is unfolding as a zigzag Elliott Wave structure where wave ((a)) ended at 20680. Internal of wave ((a)) subdivides as a 5 waves impulse. Wave ((b)) bounce is currently in progress as a Flat Elliott Wave structure. Up from 20680, wave (a) ended at 21520 and wave (b) ended at 20705. Internal of wave (a) unfolded as a double three Elliott Wave structure. Up from 21520 low, wave w ended at 21410, wave x ended at 21015, and wave y of (a) ended at 21520. Internal of wave (b) ended as a zigzag at 20705. Wave a of (b) ended at 21160, wave b of (b) ended at 21505, and wave c of (b) ended at 20705. Wave (c) of ((b)) is in progress as a 5 waves impulse. The rally should fail below March 4 high at 21884 for further downside. We don’t like buying the Index and expect rally to fail for further downside as far as pivot at 21884 high stays intact.